Their hit sitcom Roseanne will return to the TV screen this year, after 25 years off-air. 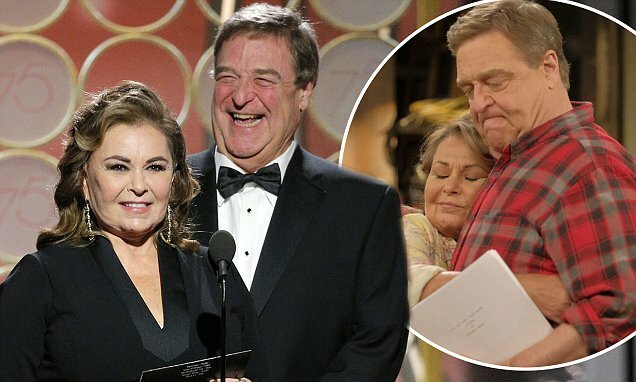 And Roseanne Burr and John Goodman had a brief reunion on Sunday night as they took to the stage at the Golden Globes. Presenting the award for Best TV series-Drama, the dynamic duo left the audience in stitches with a witty joke. Roseanne, looked sensational in a figure-hugging black gown, as she put on a united front with a galaxy of Hollywood stars to show the solidarity with the victims of sexual harassment and assault. The bubbly comedienne oozed glamour as she styled her brunette looks in sleek curls and accentuated her clear complexion with a glossy pink lip and smoky eye. John, also 65, looked dapper in a black suit and bow-tie as he joined his co-star on stage. Their mini-reunion comes a day after ABC released a fresh set of shots of the cast of the rebooted Roseanne, which returns for an eight-episode slate in the upcoming months. The show will bring back all of the original stars, with Roseanne and John starring as Roseanne and Dan Conner, with Laurie Metcalf, Sara Gilbert, Michael Fishman and Alicia Goranson reprising their roles from the first run.